Back in the early 1990’s, when software was still delivered on floppy disks, it was common for software to be sold as separate applications, with each one costing hundreds of dollars each. They didn’t communicate with each other and their user interfaces were often completely different. But then, Microsoft, which was just getting a handle on dominating the operating system market, came up with a revolutionary idea. It was the software ‘bundle’. They packaged their word processor, spreadsheet and presentation designer into a product suite and sold it for one low price. What was once revolutionary, soon became commonplace, as other software vendors copied the Microsoft Office Suite concept and launched their own bundles. None were ultimately as successful as Office, but the way software was sold was changed forever. A similar trend is occurring in the wealth management platform space. Where there was once a thriving marketplace of standalone applications for functions such as risk profiling, proposal generation, account opening, portfolio rebalancing and reporting, there is now a movement towards combining them into an all-in-one platforms. 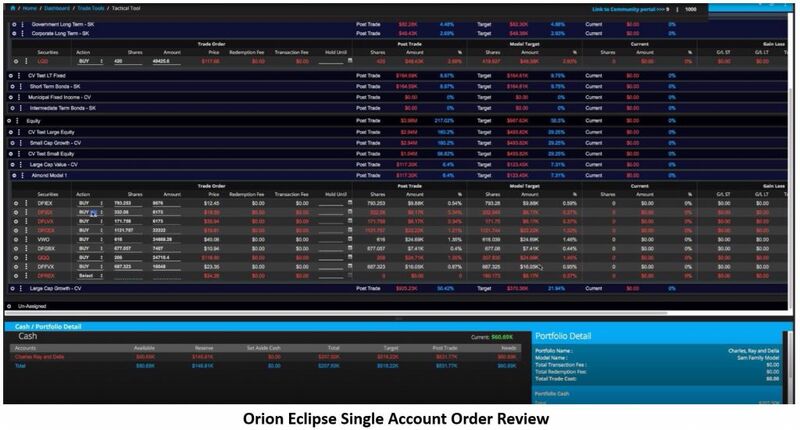 Orion, which has around $425 billion in AUM across 1.7 million accounts, has always had a basic trading and rebalancing tool that it is currently used by 60% of their clients. But seeing the changes in the market as competitors like Morningstar purchased Total Rebalance Expert (TRX) to enhance their Office platform and custodian giant Fidelity built a new portfolio rebalancer from scratch for WealthCentral as well as requests from their advisor base gave them the impetus to build a more robust application. Eclipse is a 180 degree change from the previous experiences we have had the Orion Advisor platform. Everything we saw in earlier demos was built on top of Salesforce.com, which does not have the most appealing user interface, to put it mildly. This new application, which took around 18 months to build, appears to be completely separate from the Salesforce code and has a clean, modern look and feel. Overall, the user experience is excellent. It is easy to navigate, take action on exceptions, follow the workflows to process accounts and portfolios and run rebalances, review/edit the orders and send out for execution. 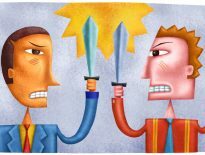 Households or Portfolios of Portfolios? Eclipse has the ability to assign multiple accounts to a portfolio and then build portfolios of portfolios. This structure is how a firm would represent client households for rebalancing and reporting. There is no specific concept of a household in the system. While this does provide greater flexibility, I would prefer that my portfolio management system have a household object. I like to see the total number of households on the dashboard and to be able to interact with households across all functions. I believe it is confusing to call everything a portfolio. 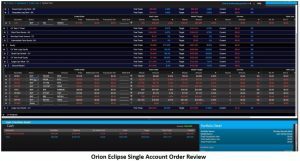 Eclipse allows advisors to create different account groups for trading and reporting, so there can be multiple account hierarchies in use for different purposes. The model management tool is one of the most innovative features of Eclipse. It includes a drag and drop tool for creating and editing models with color coding to highlight each asset classs. Every other model manager we have seen uses a simple list of contents for models with drill downs into sub-models. But the Eclipse interface provides an intuitive way to work. Eclipse supports models of models with unlimited levels. We have rarely seen any firm, no matter the size, go past four levels of sub-models. But the capability is there with this tool. Models can not only be based on asset classes, but also sectors or industries. The user interface makes it easy to build and edit complex models with as many sub-models as needed. Tolerance bands and targets are set by right clicking on any icon in the tree. While most firms do not have over complex model needs, the ones that do rely on multiple levels and sub-models will see a boost in productivity. Orion has set a new standard for model management with this visually-pleasing application. I was impressed by the level of control available in the rebalancer settings. For a first version, the sheer number options are comprehensive and could be overwhelming for smaller firms. Fortunately, most of the setting have defaults and Orion offers training to help understand how changes would impact the rebalancer output. These settings allow a firm to configure the rebalancer to match their specific investment strategies and enforce them across the entire book of business. Exceptions can be carved out for groups of portfolios or single accounts. The rebalancer can be run on groups of accounts that are created using the Query Builder. It is for more technically-savvy users and can query the Eclipse database and extract lists of accounts that match specific criteria and create custom trade groups to use in other parts of the system. For example, a list can be created of all IRA accounts at TD Ameritrade with cash greater than $500. You can then run this list of accounts through the rebalancer by simply selecting the new trade group from the list. Security equivalents are supported on multiple levels: security, class, sub-class, and category, all done using the concept of security sets. Security sets can be customized and tagged for each client and enable an additional level of configuration for rebalancing. A scenario that leverages security sets would be something like this: assuming all models contain 10% equity large cap, each client could have a unique security set where different securities are mapped to large cap. This might seem overly complex, but it is a level of flexibility that some firms will be able to take advantage of. Especially, if they have a lot of accounts that were funded with low cost basis positions that the clients do not want to sell. This feature will require additional training, since it has the ability to override model settings as well as firm level configurations. Firms will have to be careful when creating security sets to avoid possible compliance issues. Eclipse offers a number of trading tools for firms that either are not model-oriented or have ad hoc trading requirements. All of these tools can be accessed via a context-sensitive menu from any screen that contains one or more accounts listed. Eclipse includes an order management system (OMS) where all orders are queued up for review before being sent to their execution destinations. This is similar, in some ways, to Tamarac’s Advisor OMS that is built into their Advisor Rebalancing Module. It is a change for Orion clients who were using an external portfolio rebalancing solution, such as Total Rebalance Expert (TRX). TRX requires the advisor to review the results of each rebalance separately. In Eclipse, Advisors have the option to review all trades together or drill down and only view the trades for a single account. Orion has implemented Straight Through Processing (STP) via FIX (Financial Information Exchange Protocol) for equities, ETFs, and mutual funds, which can be sent directly to custodians and other execution destinations. Orion uses FIX Flyer as their primary FIX network but compliment it with Sungard for access to smaller broker-dealers or executing brokers that might not be connected to FIX Flyer. So, their clients get the best of both FIX worlds. If an RIA needs to send trades to a non-FIX executing broker dealer, they can always export a file and send it manually. A number of asset managers use the Orion legacy platform, so they added support for trading away with automated allocations. This is an advantage over Tamarac since Advisor OMS requires traded away allocations to be handled manually. External OMS connectivity is possible through the Eclipse API or via a FIX network. However, none are active today. Eclipse has been designed from the ground up as an enterprise platform. This is apparent from the roles module, which is in the Admin area. A system admin can define what each user can and can not do and which sections of the platform they have access to, all at a granular level. Different roles can be created for traders, wealth managers, compliance or any other group. The concept of teams allows groups of users to be assigned permissions simultaneously, which is a time-saver. Teams can also be limited as to which portfolios and models they have access, while the home office can see everything. This is a helpful option for larger firms with multiple offices. Many different operational models can be supported. Satellite offices can allowed to create and edit their own models, rebalance portfolios and execute trades. Or the home office can control trade execution while the satellite office handle everything else. Or something in between. The user roles function provides tremendous flexibility. 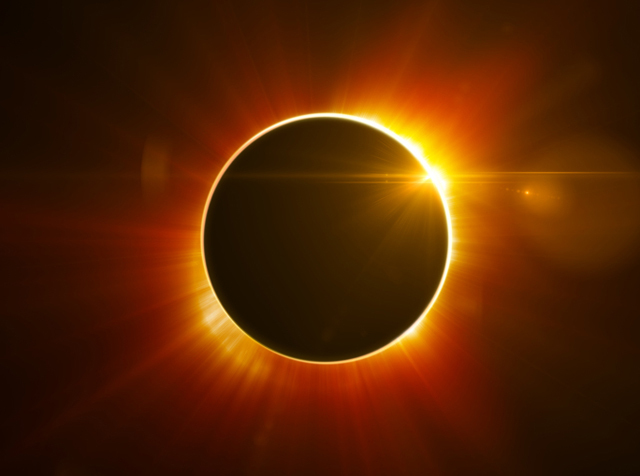 Orion has around a dozen firms that are planning to deploy Eclipse to their satellite offices, when it becomes available. Minimizing the tax impact on clients has become one of the primary benefits of automated rebalancing tools. Simple configurations such as avoiding trades that would generate short term gains or that would violate wash sale rules are old hat. Every tool has them, plus a host of other tax-related functionality. What sets a rebalancer apart are the advanced features that can significantly reduce operational effort or add value for clients. Eclipse provides both with their tax loss harvesting feature. After a position is sold for a loss, Eclipse has a process that will automatically invest the proceeds in an equivalent security (usually an ETF). After the thirty day window has passed, an alert will appear on a dashboard to prompt the user to run a workflow to buy back the original position. Through the global settings, the amount of capital gains can be capped and the rebalancer will alert the advisor if the sell orders generated would take the client over the restricted gain limit. We have not seen these options available in other portfolio rebalancing tool. Eclipse utilizes ByAllAccounts and Quovo for data aggregation and bringing in data on held away accounts. This includes accounts held at other custodians as well as various retirement plans. An advanced feature that we have been seeing in other systems is the ability to review the holdings of restricted retirement plans as part of a client’s overall holdings and generate recommended trades. Of course, the advisor can not execute those trades, but they can be sent to the client who can make them or forward them to their record keeper. Some advisors even charge fees on these assets, since they are provided a level of advice on them. Orion launched a partnership with TRX a few years ago to integrate with their portfolio rebalancing tool. Around 40 Orion customers are using TRX and they plan to continue to support them, at least for the near future. Although, I imagine there will be some strong monetary incentives offered to try and tempt them to switch to Eclipse, when it is ready. Orion also offers a billing solution that is integrated into their portfolio accounting platform. Around 800 client firms are currently using it. The pricing model for Eclipse is simple. An extra 15% will be tacked onto the price per account that clients are charged for Orion’s portfolio accounting services. The length of time required for setup depends on the number of unique securities and accounts in use across the firm. It also depends on how many client exceptions there are. DFA shops are relatively quick and an be up and running in less than a week. One beta firm with 90,000 securities across 20,000+ accounts required almost a month to complete. Eclipse is currently in beta testing with around 12 firms, soon to be ramped up to 50. The beta test will end sometime this summer and a full launch is planned by the end of the summer. Based on the functionality we have saw in the demo, Orion has done an excellent job of thinking through the design and architecture of Eclipse. The portfolio rebalancing engine is robust and appears to be an equal to the top rebalancers available today. We will need to see the system perform under real world conditions outside of the beta testing group to know whether the it really delivers on what was shown in the demo. If everything goes according to Orion’s plan, when Eclipse is launched in Q4, the market will have a serious competitor on their hands.